Thanks to Hil J for sending me this photo of a road sign he saw in Mid-Suffolk. 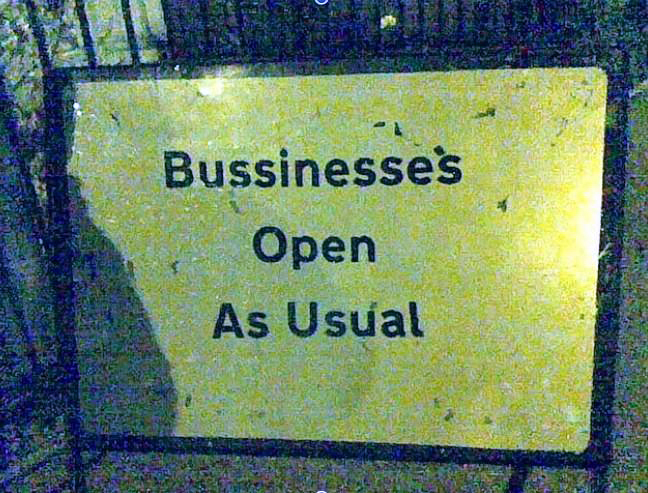 I've seen several signs with similar attempts at spelling the word but this, complete with its apostrophe that's not really sure whether it should be there, takes the biscuit. As it states clearly that it's Open, I thought I'd try and find out exactly what this Bussinesse is. It's not on its own. Can you believe there are 126,000 listings for Bussinesse on Google? Including this page on Fiverr which actually has a category called Bussinesse. And this fantastic blog whose title refers to something called bessiness yet posts under a Business heading every month before, in a bizarre twist, changing to the alternative style for the very latest post.